» The NBN is broken. Here?s the fix. A change of leader. Time for a change in direction. The approach to the NBN has been fated from the beginning. This paper explores how the original design was more to do with constraining Telstra?s monopolistic ambitions than developing a sensible broadband policy for Australia. The result is a solution that is expensive, constrains competition and is blighted by Telstra?s infrastructure ? including the widespread use of asbestos ? with a one-size-fits-all approach that satisfies few. The ambition of ubiquity is also examined. How can it be ubiquitous if many people choose not to subscribe? With the optimistic air of change that has come from a new Prime Minister, this is the time to look at a realistic option which accepts that the approach will include government on-budget expenditure, establishes a future-proof approach and provides the opportunity for those who want it to pay a realistic amount towards getting connected. The analogy is, governments build roads, not driveways. So why should we assume anyone building a national telecommunications network should worry about connecting right up to the front door, especially for those who don?t want it. If we look back over the last six or seven years, can we consider the evolution of the NBN to be anything short of a disaster? Is anybody entirely convinced it will ever be finished, according to plan? And, by plan, you can take your pick, because there have been so many of them. It seems Stephen Conroy?s grand vision was nothing short of a fairy tale ? a very Grimm one. Back in 2009 the Senator figuratively donned his red cape and marched into the forest, little knowing that a big bad Telstra lurked there. ?My, what big profits you have,? the innocent Conroy would have observed. ?All the better to monopolise you with,? comes the reply. That was certainly the view of Maha Krishnapillai in one of my early Twisted Wire podcasts on ZDNet back in 2009. In The Economics of the NBN (Dobbie 2009a) Krishnapillai, who at the time was the director of Government and Corporate Affairs for Optus, described the incumbent as a ?rogue corporate?, who ?price gouges the industry for their benefit?, with the economy, ?held hostage by one private monopoly extracting monopoly rents?. Sadly, the NBN started its life as a retaliatory move against the strong stand Sol Trujillo took against the government. Senator Conroy had clearly taken the view that, if Telstra wouldn?t play ball and help build a broadband network, the government would do it itself. Showing Telstra who?s boss seemed almost as important as building the infrastructure. The quickly formulated strategy had many holes in it ? not least, the expense of it all. The revised approach taken by the current government is a compromise, but the solution it offers hardly improves our standing on the league table of broadband speeds. In this article I will track how we got to where we are today and suggest that one sensible approach, that balances cost and benefits to the nation, has not been considered. And, unless NBN has already put in its order for thousands of street cabinets, it?s not too late to switch direction. Take the top 20 most productive countries in the world, and all but three have faster internet speeds than Australia. From this list I have excluded very small populations, together with Saudi Arabia and Bahrain, two countries not included in the Akamai State of the Internet Report (2015). The three that fall below Australia are the United Arab Emirates, a country with a huge income discrepancy, along with France and Ireland. Data source: Akamai State of the Internet Report (2015). It?s ironic that Alcatel-Lucent, a company that is busy getting broadband to so much of the world, has done little to increase speeds on their home turf. It?s more concerning to Australians, though, that we continue to experience some of the slowest speeds in the western world. You can take some comfort from the fact that things are improving. In the first quarter of 2012 Akamai had Australia averaging download speeds of just 3.5 Mbps. We?ve more than doubled that in the last three years. If we can do that again, by mid-2018 we wouldn?t be far from where Hong Kong, Holland, Sweden, Japan, Switzerland and Norway are today. Sadly, those countries have all shown tremendous growth and that?s not likely to stop. So, I doubt we?ll ever get anywhere close to them, particularly as the upward impact of the NBN has been compromised by the new multi-technology approach, that will see fewer premises hooked up with fibre. We are, it seems, destined to remain in that third tier amongst developed nations. There?s been a lot of debate about the importance of broadband. In an open letter to the ITU Conference in Korea last year, the Broadband Commission for Digital Development (2014) urged delegates to push ahead with broadband as a top priority, arguing that digital inclusion is ?of paramount importance to ensure that no one, and no society, is left behind?. In developed nations, though, won?t the delivery of technology, tried and tested throughout the world, simply respond to consumer demand? In a country like Australia, where the average full-time worker is making more than $1,500 per week (ABS 2015), can?t we trust consumers to make their own decisions on what they spend money on, and see suppliers respond to that demand? Can?t the free market determine the way forward? 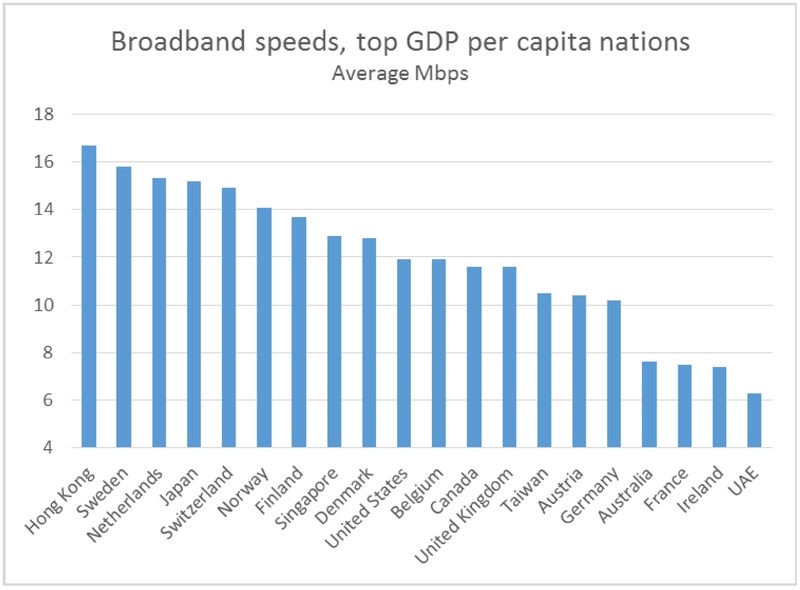 In which case, why has Australia been so slow to adopt faster broadband? Some argue it?s because we have such a disparate population. Our average speeds will always be hindered by huge distances and remote communities. Certainly, with just 3.2 people per square kilometre (Wikipedia 2015) you?d have to go trekking through Mongolia to find a more sparse population. Yet Australia is one of the most urbanised nations on the planet ? more so than the US, Canada or the UK. What?s more, when I examined broadband speeds using ZDNet Speedtest data in 2012 (Dobbie 2012) I found that the fastest DSL coverage was often in small towns, where populations were small and lived close to the exchange, and where copper diameters tended to be larger than in cities. In these areas only a handful were living on remote farms far from the exchange. Most enjoyed fast speeds with low contention. In many countries the non-urban population is far more disparate. Take the UK as an example. It has a far more densely packed population, but a smaller proportion live in urban areas. Eden, for example, is a district of more than 2,000 square kilometres in the heart of the English Lake District with just 25 people per square kilometre (Eden District Council 2015) ? 52,000 people that would be very difficult to reach with high speed broadband. If we dismiss the geographic argument as the reason for our poor showing in the league table of internet speeds, we can come to only one conclusion about our dismal performance: the competitive environment. To give Senator Conroy some credit, that?s the issue he was trying to correct when he announced in September 2009 that Telstra would need to find a way of splitting itself up into wholesale network and retail divisions. On my Twisted Wire podcast (Dobbie 2009b) he described it as fixing a regime that was broken: ?a mistake by the Hawke government taken further by the sale of Telstra by the Howard government?. Few in the industry disagreed with him. Mistakes had been made. Telstra should clearly have been split before it was sold. Had that happened, there?s little doubt that we would be experiencing faster broadband speeds today as Telstra?s network division pushed on, with the promise of revenues from multiple wholesale customers. It would have been a good move for Telstra retail too. In that same podcast Simon Bartholomeusz from Business Spectator said that they could thrive, cut free from the diversion of infrastructure. Certainly that was the case in the UK. When BT was split, back in 2005, retail revenues slid, but profits steadily improved (Dobbie 2011), showing they?d become vastly more efficient through the process. Of course, Telstra didn?t split in the same manner as BT or Telecom New Zealand. Instead they tied the process to the NBN. As customers migrated to the new network, Telstra would switch off the copper connection and be recompensed for it. It satisfied Senator Conroy because it resolved two issues ? it saw structural separation occur, whilst theoretically expediting the rollout of the NBN. Telstra had an incentive to ensure they played along. It was a nifty negotiation on Telstra?s part. They?d gone from the threat of having to divest themselves of their share in Foxtel and being barred from future 4G spectrum auctions, into a model where they were paid compensation for handing over customers, even though they?d continue to receive revenue from many of them. Nonetheless, it was argued, this was separation. Telstra no longer owned the last mile ? except in regional Australia where the copper network, curiously, would be maintained because of some archaic principles around what constitutes a standard phone service. As part of the deal Telstra gave access to its ducts, supposedly making it cheaper and quicker for NBN to shoot fibre through. It wasn?t clear at the onset what state those ducts were in and, it seems, the prospect that some, if not most, were riddled with asbestos cement, would make it hugely dangerous and expensive to shoot anything through them. Perhaps NBN should have read Telstra?s own assumption, contained in a fact sheet issued in 2013, that ?unless the pit is made of plastic it will be assumed to contain ACM (asbestos containing material) and treated appropriately? (Telstra 2013). A change of government saw a change of approach, with Malcolm Turnbull arguing the need for a faster rollout, highlighting the likely escalation in costs if things were done the old way. It?s possible the asbestos issue alone could have brought the project to a screaming halt. The multi-technology mix approach would, he argued, speed things up and contain costs. Protracted negotiations were then held with Telstra to get them to vend-in their copper without bumping up the NBN?s costs by too much. Using copper for the last-mile at least minimised the risk that the asbestos threat posed. The whole process, though, has generated enormous anomalies. In a bid to create a workable business model, the original plan was dependent on NBN being a fixed-line monopoly. That meant Telstra and Optus needed to close down their HFC networks. Try finding an economist who can justify disposing of a working asset, particularly one with a clear upgrade path. Secondly, the cross-subsidisation approach presented enormous challenges. The cost of reaching and maintaining services in regional Australia is huge, requiring NBN to effectively impose a tax on metropolitan users to help fund the remainder of the network. This presented a challenge. Competitors could cherry-pick the easier-to-serve metropolitan areas, particularly large multi-dwelling units, without worrying about the cost of serving the rest of the country. Labor?s approach was simply to ban competition, a rather stark economic policy in this day and age. The current government believes infrastructure competition should be allowed, and TPG has been quick to reach for the low-hanging fruit ? apartment buildings close to their existing fibre network. Communications Day (Wilton 2015) speculated that they may already be offering services in as many as 350 multi-dwelling buildings, with plans to reach 90,000 individual households by the end of the year. Such a move cuts holes in the NBN?s cross subsidisation approach. The government is left with the choice of either raising NBN prices further in metropolitan areas ? increasingly the likelihood of more competitors undercutting them ? or charging competitors a levy, so that everyone, in effect, pays the cross subsidy. It?s an approach that I know has not been well received by those seeking to fibre-up buildings in competition to the NBN. There?s also the deeper question of whether such a measure could be challenged by the Trans Pacific Partnership (TPP). Wikileaks (2015) released what they claim to be a 2013 draft of the TPP, which discusses whether controls on subsidies should be extended to state-owned enterprises. That could potentially rule out cross subsidisation and charging competitors that subsidy, particularly those funded by another TPP country. If the competitive issues raised by the NBN are a problem, the cost structure is worse. Those who still cling to the original model, a utopia of fibre for all, built by a government monopoly, should consider the 2012-15 Corporate Plan (NBN 2012), which assumed an average revenue per user (ARPU) exceeding $40 at the onset and escalating to $100 by 2039 (in nominal dollars). Even the latest plan (NBN 2015a) keeps ARPU below $44 for just the first few years and is reliant on higher ARPU down the track to make the business model work. Sadly, I think the original plan was a pipedream. The NBN assumed different prices dependent on the speed of your connection, even though higher access speeds had no discernible impact on NBN?s cost structure. It was clearly a way to make NBN pay for itself. To me it was reminiscent of Telstra?s response to a competition notice in 2001. The telco was in trouble for offering low-end retail broadband plans that were close to the same price as their wholesale broadband product. To pacify the regulator, Telstra offered wholesale customers tiered pricing ? even though it cost Telstra no more to offer the product, whatever the speed used. In effect Telstra was using wholesale pricing to determine the retail pricing structures of its customers. The NBN was doing the same, and still is, although the opportunities for greater speeds are now diminished by the technology. So, we are caught between a rock and a hard place. The original plan would have offered high speed broadband, but assumed people would be prepared to pay a lot for it. Early launch pricing in no way reflected what would have to be charged a few years down the track. The alternative is still expensive and customers can expect lower speeds. As I pointed out earlier, we?re spending a lot of money to reach the stage that many countries are at now, or were at several years ago. Those countries are charging a lot less than Australian retailers will be able to afford, given the high wholesale costs of the NBN. Right now BT in the UK is offering FTTN plans (speeds up to 38Mbps), with 40GB usage, plus sports content, for ?28 per month. That?s around sixty of our rapidly diminishing Australian dollars. According to the current NBN Wholesale Broadband Agreement (NBN 2015b), to match that today, a wholesale customer would be paying $34 for the access circuit, plus the connectivity circuit and backhaul. Take a quick scan of the prices offered by cable operators around the world today, and you?ll see Australians will be paying well above the odds for the moderate improvements they?ll be seeing in their broadband speeds. Figures from the OECD Broadband Portal (OECD 2014a), released in September 2014, show broadband prices in Australia range from US$32 to $105.60, compared to $28.30 to $59.10 in the UK ? a country Malcolm Turnbull often pointed to when, as shadow minister, he was making the case for a multi-technology approach. The UK customers are paying less, but enjoying faster speeds. In fact, their cost per megabit-second ranges from $0.32 to $2.43, compared to $0.48 to $7.47 in Australia. That was a year ago. Our prices don?t reflect the increased impost of NBN wholesale pricing, so we?re likely to be paying a lot more down the track to receive the services they are currently enjoying in Britain. Clearly, the NBN is costing too much and that provides a real challenge to one of the original aims of the network ? ubiquitous access. Only if everyone is connected and using the internet can government departments and companies rely on it as a channel for doing business. Telehealth only works if people are online, and online voting will only replace booths at local schools when everyone is connected. And, even then, where do you go for the sausage sizzle? The real challenge to ubiquity is not whether you can have a broadband connection ? for many it?s a question of how much it costs. In a May 2013 article I analysed the 2011 census to see which areas had the highest penetration of home internet (Dobbie 2013a). Four of the top 10 local government areas for broadband connectivity were on Sydney?s moneyed upper north shore, whilst penetration was lowest in areas with low household income. Is the digital divide less to do with geography and more to do with income? In which case, if the NBN is making broadband more expensive, could it be making the digital divide worse than before? Will it really achieve a public good if many people can?t afford it? In August 2014 the government released a cost benefit analysis (Department of Communications 2014) compiled by the Vertigan panel, which used willingness to pay as the measure of the utility that individuals and the economy received from the NBN investment. They used a technique called choice modelling, asking customers to choose between possible internet plans. The approach found that someone currently paying $75 for a 10 Mbps service, would pay $20 to double their speed, but the incremental value rapidly diminishes as the original speed increases. They also found a massive discrepancy between informed respondents ? who were told some of the benefits that could be derived from high speeds ahead of choosing a plan ? and the uninformed audience, who weren?t. The latter group would pay just $5 to go from 10 to 20Mbps. Whilst I am sure the reasoning is solid, the research seems to put a high price on the benefits. In other words, it accepts that people will be paying a lot more for broadband in Australia. If that?s the case, it?s another example of how the NBN, by charging a premium, could be broadening the digital divide, making NBN out of reach of lower income households. OECD data (OECD 2014b) shows that in the OECD we currently rank 21st for broadband penetration (fixed line, fixed wireless and satellite) with just 27.7 subscribers per 100 inhabitants. Switzerland, at the top of the table, has 48.9 connections per 100 inhabitants and, as I have already observed, average speeds twice our own. So, the story of our situation gets worse. We?re behind the rest of the world in terms of speed, we pay more than most and have an expensive project that will push prices higher, potentially preventing more people from becoming part of the connected age. It seems a long way from the low cost, ubiquitous broadband we were promised at the onset. Despite this, the NBN Corporate Plan 2016 (NBN 2015a) envisages 4.4 million subscribers by 2018, bringing in $2.5 billion in revenue. Good luck with that! NBN?s biggest problem ? and always has been ? is that it has been treated as a project that will provide a financial return. It?s going to tackle the issue of access across all parts of the country, and it will, miraculously, pay for itself and provide a return on the investment. Remember Conroy?s claims in 2009, on the formation of NBN, that the company could raise its own debt, with half the risk being carried by private investors? Since then, the whole project has been driven by this need to provide a return ? a project that will provide a public good, without any costs appearing in the budget. It?s an investment, no more, no less. Whilst that might be fine for a metropolitan network, it seems unreasonable for a commercial project to carry the responsibility for funding a regional roll out. That, surely, falls into the domain of government support. For example, the government is happy to spend money on roads. Over the next five years the Federal Government is flagged to cough up more than $50 billion on land transport projects in partnership with State and Territory Governments (Commonwealth of Australia 2014). If broadband is considered as another essential infrastructure, is it beyond the pale to consider that it should also attract some government subsidy? In fact, if we assume that NBN will not achieve its fiscal objectives, with the Corporate Plan assumptions dissolved by competitive activity and the impact of mobile networks, then, likely as not, it will appear as an on-budget item at some point. Isn?t it just a matter of political expediency to make the call now and start working to a realistic set of assumptions? The biggest issue for the NBN is regional Australia and the complexities that cross subsidisation has created. Had Telstra?s separation occurred before the NBN had been started, likely as not the network arm would already have rolled out FTTN to large parts of Australia and would be looking at the viability of providing fibre to some premises, where the returns made sense. If we?d gone down that road, the government would be stepping in to provide support for builds in regional Australia. It was the plan with the Opel project, when the government was set to invest almost a billion dollars in regional broadband. If the government was prepared to invest taxpayers? money in regional Australia then, why not now? The answer might be because the recent cost benefit analysis showed it?s not worth it. Malcolm Turnbull had long argued of the need for a cost benefit analysis for the NBN. Before him, Mick Minchin repeatedly made the same point. When the report (Department of Communications 2014) was finally delivered, it showed net benefits of $24 billion if the build was focused on non-rural areas, falling to $17.9 billion when the fixed wireless and satellite areas were included. In other words, according to this report, the benefit to the nation would be greater if the NBN wasn?t rolled out to regional Australia. If Labor had enlisted the Vertigan panel to conduct a cost benefit analysis like this all those years back, surely the conclusion would be not to build at all. The benefits derived from regional coverage don?t counter the costs and in the cities we?d surely see commercial forces drive infrastructure investment, particularly if Telstra operated as a vertically separated entity. Despite this conclusion, nobody ever doubts the need for better broadband in regional Australia. Yet the Vertigan Review seems to indicate they?re not prepared to pay for it. At least, not right now. For all the confused negotiations and policy direction changes, Australia needs high-speed broadband as a matter of urgency. In fact it?s likely to be vital for the future of the nation. Almost half of all jobs today will be replaced by machines within the next 20 years[i]. That?s the prediction of Michael Osborne, a University of Oxford Associate Professor and an expert at robotics research. He admits many jobs, like mental health counsellors and primary school teachers, will be exempt, but others, like telemarketers, tax preparers, even those in the legal profession, are ripe for replacement (Osborne 2014). Yet this displacement of jobs wasn?t considered in the NBN?s cost benefit analysis. The ?willingness to pay? approach assumes the social benefits you receive from fast broadband ? such as reduced travel time as you work from home ? will mean you will value the benefits more and, therefore, be convinced that you should pay more. But does this approach take account of the jobs of tomorrow? A coal miner might place little importance on broadband today, but when he loses his job and there are no other opportunities except online, he might take a different view. When I put this to Henry Ergas, Professor of Infrastructure Economics at the University of Wollongong, and one of the authors of the cost benefit analysis, he suggested many things will change at an individual level over 20 years, but overall incomes will rise. With that rise in income, so will the willingness to pay more for broadband services. That might be so, but what if technological change will be as rapid as the likes of Michael Osborne would have us believe? Then the needs of individual sections of society ? those displaced by the change ? could become more important than any increase in aggregate income. Had the NBN?s cost-benefit analysis been taken at face value, there would be no benefit from rolling out to regional Australia. Without faster broadband, people with displaced careers would have no adequate digital infrastructure to turn to. The argument could be extended to the question of speed. Nobody needs very fast speeds now because they predominantly use broadband to watch TV and browse websites. What if, in 20 years, jobs present an entirely different infrastructure requirement? Our willingness to pay would be much higher, because our careers depended on high speeds, but sadly we were asked the question back in 2014, when speed was less important. The problem is, we don?t know what the future holds and what technology will be needed. It?s certainly dangerous having governments make decisions on these things. OPEL?s Wimax proposal is a case in point. They could have invested in a technology that was quickly superseded by 4G. So, what is the best approach going forward? After seven years interviewing people in the industry, often on the vagaries of the NBN, the most sound advice came from Peter Cochrane, a 38-year veteran of British Telecom, on my Crosstalk podcast two years ago (Dobbie 2013b). Cochrane argued that fibre is the future, but telcos shouldn?t take it all the way. ?They?re continuing with this old idea that they have to get into the home and install stuff,? he said. Instead, the alternative is that NBN builds fibre down the street, provides as many access points as possible, and that?s it. It?s left to the market - the retailers and the homeowners ? to decide what happens next. The homeowners commission or carry out the work, by whatever means, at a time that makes sense to them. The analogy is that governments build roads, they don?t build your driveway. This approach seems future proof, as much as anything can be. Those who want fibre to the home immediately can pay to connect, with the NBN ensuring the cost is minimised by offering as many access points as is feasible. The coal miner who loses his job and sees a future online, connects once he has come to this realisation. Sure, it?s an approach that would see a far slower uptake and would compromise NBN revenues, but it would be preparing us for the future and would cost less than funding FTTN, an interim technology that many countries have already surpassed. It also suits the government?s free market rationale as competition develops from companies offering connectivity to the home. In fact, it would create competition at one of the most expensive and diverse elements in the whole delivery chain. Government subsidies could be provided for households where connected costs exceeded a certain level. In the meantime, we?d still need our copper connections. That would satisfy many who don?t see the need for the NBN right now. And it would mean a further renegotiation with Telstra to hand it all back to them. Presumably the same arrangement would stand, that Telstra would be paid as copper is switched off, but the copper network would only be switched off once everyone had moved to the NBN. That could take decades. Meanwhile, Telstra could continue to be the provider of last resort, using the money it receives from the Universal Services Obligation to maintain its old network. There are numerous benefits in this approach. The build costs would be significantly reduced as the NBN focuses largely on rolling fibre down the street, not worrying about the complexity of access. The legacy agreement between NBN and Telstra could still stand, but cash paid out would be spread over a far longer timeframe, giving NBN more chance to effectively balance revenue and expenditure. The only drawback is ubiquity. Not everyone will be on the NBN, but, unless you make it free, that will never happen anyway. As I have argued, the high cost is the biggest challenge to ubiquitous access, particularly as those seeking lower prices move to wireless. Is it too late for a move like this to happen? Probably. But it?s surely worth some discussion, particularly as so much political change is happening right now. I don?t think the fibre purists would be too upset at the idea of paying to connect to the NBN. After all, it?s no different from paying to connect to the Foxtel network, or paying Telstra to add an extra line to your home. To me it seems a simple and effective way of building high speed broadband and sharing the cost with those who derive the benefit. What?s not to like? What is clear is that Australia is spending a lot of money to bring us in line with where many other countries are today, or were a few years ago. It is expensive to build and that means high prices for consumers. In the meantime it has inhibited competition and investment. Despite all these issues, the current government made only marginal changes to the approach taken by Labor. Sure, they introduced a different technological approach, but the aspirations of the NBN ? low cost, ubiquitous, uniform pricing ? seem to have been lost in the complexity of the project. The Labor government also made the fatal assumption that everybody wanted it. Instead, society has been deeply divided, making the whole project a political hot potato. So much so, these days it seems the less it?s talked about the better. The reality is that the government took on too much with this project. There needs to be a change in direction, one which recognises that people will join the NBN party at different stages in their lives. When they do, they?ll be prepared to pay towards it. The government?s role should be to make that move affordable, by ensuring homes are close to a fibre access point. Who delivers that connection can be open to competition. Change to that approach, and accept that some costs will be budgeted expenditure, not investments, and many of the issues of the NBN go-away. And Australia will have fibre to the home, for those who want it.